A copy of the IMPRESS 2 poster (above) is available from our Documents & publications page. European Directives are coming into force setting increasingly stringent Emission Limit Values (ELVs) for key air pollutants to mitigate ~400 000 premature deaths and €330-€949 billion p.a. of costs attributable to air pollution. However, the emissions industry faces an issue as a metrologically robust framework of standardised measurement methods to enforce these directives is not fully in place. 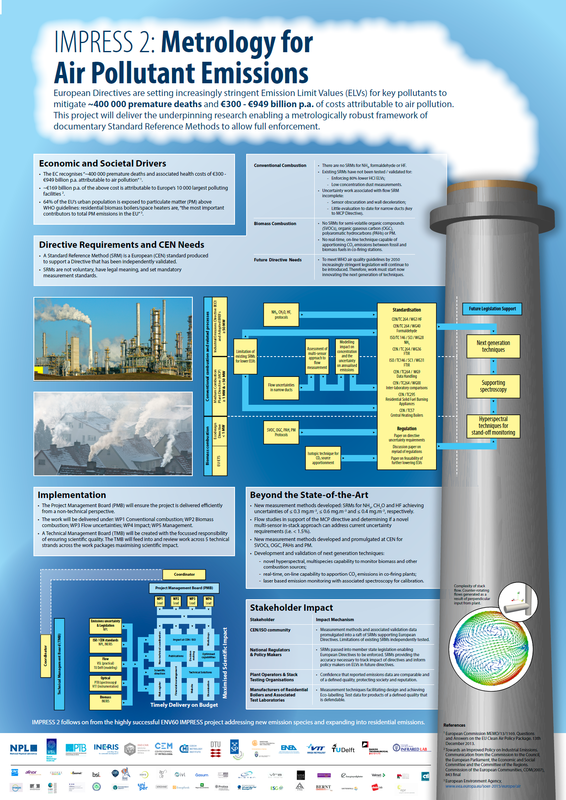 This project will address this measurement gap by innovating measurement methods for new measurands (NH3, formaldehyde, HF, PM, SVOC, OGC, PAH), address a lack of uncertainty characterisation in flow measurements and develop next generation techniques for increasingly stringent future legislation. The overall aim of this project is to provide metrology to enable the enforcement of the Industrial Emissions, Medium Combustion Plant and Eco-design Directives, and the EU’s Emissions Trading Scheme. To develop validated reference measurement methods where currently none exist for HF, NH3, formaldehyde and to test the limitations of the existing HCl SRM (EN 1911) and dust SRM (EN 13284‑1) for enforcing increasingly stringent ELVs. To develop next generation optical techniques laying the platform to enforce ELVs in future legislation. To develop validated reference measurements methods for SVOCs, OGC, PAHs (including benzo[a]pyrene) and PM from small scale combustion sources meeting Eco-design directive uncertainty requirements. To develop hyperspectral multispecies methods for the determination of emissions from biomass combustion including non-wood fuelled. To develop an on-line, real-time technique to apportion CO2 emissions between renewable and fossil fuel in co-firing biomass plants. To provide input to the development and/or revision of standards related to the emissions of semi-volatile organic compounds (SVOCs), particulate matter (PM), polyaromatic hydrocarbons (PAHs) and organic gaseous carbon (OGC). In addition, to facilitate the take up of the technology and measurement infrastructure developed in the project by standards developing organisations (such as CEN TC 264 and ISO TC 146 and those linked to the EU Eco-design Directive 2009/125/EC, MCP Directive 2015/2193 and IED 2010/75/EU) and end users (e.g. environmental monitoring and regulation bodies, the power generation sector, combustion equipment manufacturers).